British Hop Association > Hops > What is a hop? Humulus lupulus or ‘wolf of the woods’ is the Latin name for the hop. It is a tall climbing plant and is “dioecious” which means that male and female plants are separate. It is the female plant which bears the hop cones required in the brewing process. The plants are perennial (dying back and re-growing each year) and can be expected to remain productive for 10-20 years or more, sending their roots down to a depth of up to 3.75m. With the support of a matrix of wooden poles, wirework and string they can grow to a height of at least 5m. On the traditional system, the plants are tied or trained up each string in the Spring. They reach the top of the string by July and during the month they begin to flower and their cones begin to develop. The hop cones consist of layers of soft tissue petals where the lupulin glands form and they look like large yellow pollen grains. Each lupulin gland contains the oil resins which confer bitterness, preservative properties plus the aroma and flavour. It is the alpha acid in the lupulin that imparts the bitterness in the beer. A stiff oily substance, lupulin is sticky to touch and with a complex chemistry found nowhere else in the plant kingdom. It is made up of several volatile oils, which formulate the flavour used in beer. 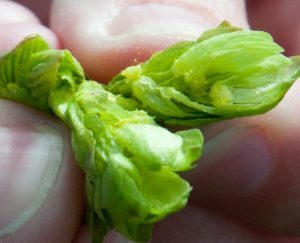 These subtle differences are evident in the cones of different hop varieties, which individually contribute to the flavouring of the beer. The UK hop harvesting season is in the month of September, when the bines of the hop plants are laden with the all-important cones. The bines are cut at a height of approximately 3 feet (1m) above ground and brought in from the field. Here they are carefully handled and fed into picking and sorting equipment, which separates the valuable cones from their leaves and stem. 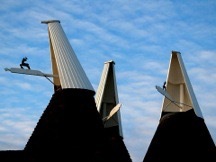 These cones are then dried in a Kiln or Oast house, which are a familiar sight in the English landscapes of Kent, Sussex, Herefordshire and Worcestershire. The drying of the hops enables them to be stored. Fresh hop cones will start to compost almost immediately. The moisture content of each cone is reduced from 80%+ to between 10-12% during the drying process and the final product is packed into pockets or bales, weighing approximately 60 kgs each. They are then dispatched directly to breweries or for further processing.